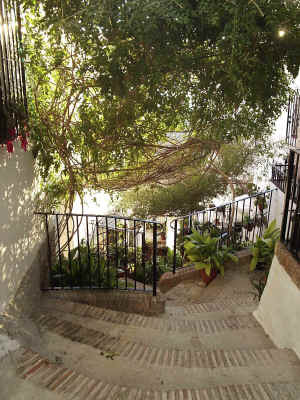 Canillas de Aceituno is a typical Andalusian “pueblo blanco” (white village) nestling on the side of a mountain (la Maroma), just 20 minutes drive from the coast and an hour from Malaga airport. It is part of the Sierra Tejeda natural park, providing many opportunities for hill walking; the path to climb the Maroma (2,065m) starts in the village, and for the more active is well worth the effort with its magnificent views from the summit of the snow-capped peaks of the Sierra Nevada to the north and Africa to the south. The village has a thriving community, with shops and a small market every Friday. There are several bars and a couple of restaurants where you can eat local dishes at a very reasonable price. Children can play safely as there is only one road through the village, and through traffic for the next village uses the by-pass. From mid-June to mid-September you can visit the local swimming pool; situated on the outskirts of Canillas it has lovely views to the sea, and a bar which serves tapas and full meals. 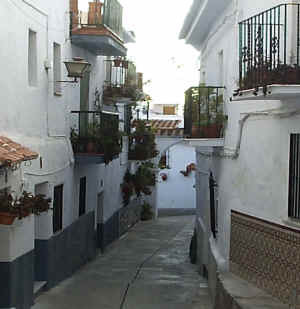 Passes can be obtained very cheaply from the Ayuntamiento (town hall) in the centre of the village. If you fancy a change from village life-watch out for mules which are commonly used for carrying the abundant fruit and olives that grow in the region! !-you can go shopping at El Ingenio shopping centre in Velez-Malaga, which includes a hypermarket and 12 screen cinema. Alternatively you could visit the popular seaside town of Nerja with its famous underground caves, which is a 40 minute drive away, or the new Picasso museum in Malaga. The property is a typical old village house which has been totally renovated. It is ideal for a larger family, but could also be used by two families of four. Entry is into the living room, which has a double sofa-bed and a wood burning stove for those cooler evenings in winter. There is a bedroom off the living room with 2x2 bunk beds and a walk-in cupboard. From the living room there is a hallway which opens onto a patio and leads to the kitchen-diner and downstairs shower-room. Upstairs is the master bedroom with double bed and en-suite shower-room, first floor terrace and a second floor terrace with lovely views over the village roofs to the mountains. The house contains washing machine, microwave, fridge with separate freezer compartment, 4-ring hob and electric oven, barbecue, mini hi-fi; we will provide bedding including sheets and towels. These prices are for the property per week. Extra nights may be booked on a pro rata basis. From now until 31st March, we are offering the house for £250 per week. A refundable security bond of £70 will be required against damage to the house and contents.